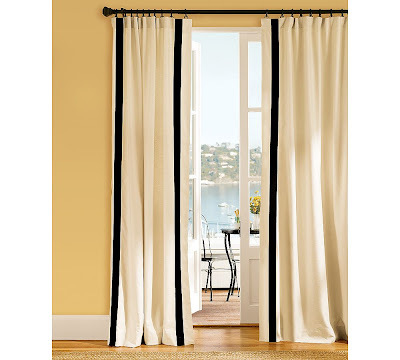 One of my projects for this weekend is to put a ribbon border on the curtains in the family room. (as seen HERE) I think they need a little something extra, and also to make them stand out from the couch. What do you think?? So, I purchased a roll of 100 yards of white satin ribbon to go ahead and start. I pinned up one side to see how it looked and to me it was really, I don't know, shiny (and yes I know it is satin ribbon, the stuff is shiny). Ok, here is the dilemma...is the satin ok to use? Has this been done before with satin ribbon? OR do I need to scrap it and use grosgrain ribbon, which is less shiny? Please help, what should I do?? The top image's ribbon seems to have a touch of shine to it?? It would give it a little glam to do the satin! Do you have some grograin ribbon on hand? Put them both up next to your panels and see which you like. Sometimes...with some ribbon, you can turn it over to the less shiny side. Is that possible? no.35style, that is a great idea, I am going to try that with both and see which I like better. Have you thought of running the ribbon the other way? 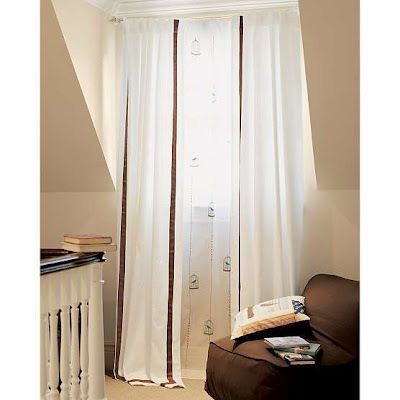 Across the width of the curtain, along the bottom of the hemline and then about half a metre above in the same line. If you have enough ribbon you could even make three parallel bands? The shine would perhaps be less obvious and more effective closer to the floor but still add that necessary edge to your window treatments.